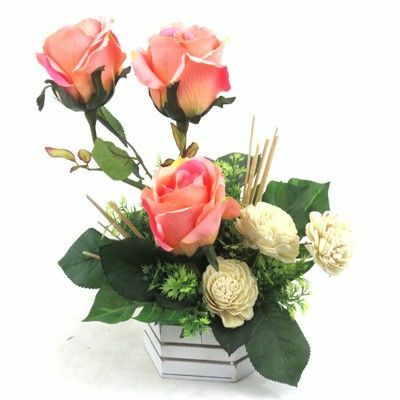 An exclusive arrangement of pink roses with white wooden lady flowers nicely crafted in a classic wooden vase. Arrangement size: 1' x 1'. Color : Green, Red, Pink, White, Black, Blue, Brown Material : Synthetic Cloths, Metal, Wood, PVC, Rubber Product Dimensions (LxBxH) : 8"x8"x12"